Performing great chamber music with humorous anecdotes on the life and times of the composers!Colin Matthews and Max Kasper first met over 20 years ago while both were students in the National Youth Orchestra of Canada. After a decade of playing in different parts of the country, Colin and Max found themselves living in Halifax where they started reading duets for fun. These readings evolved into being more serious once both musicians discovered the potential of this combination. Their debut concert was at Bearly’s House of Blues and Ribs. Since then Max and Colin have played in many places around the province, including the Octagon, the Lillian Piercy Concert Hall and the Music Room. 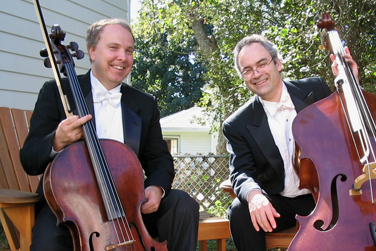 They have just completed their first CD, Gatto Dolce Duo, Duets for Cello and Bass.